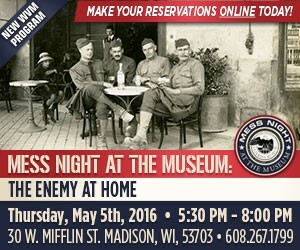 The Wisconsin Veterans Museum is pleased to announce a new quarterly event: MESS NIGHT AT THE MUSEUM. These Mess Nights are based off of the naval military traditions, which have a long history in the Navy and Marine Corps. While the tradition and ceremonies vary from branch to branch, Mess Nights are generally formal events for the Officers of the mess, and occasionally include command and personal guests. The history of Mess Night can be dated all the way back to the Vikings, who celebrated victories and heroes at feasts. Navy and Marine Corps traditions can be traced back to England, through monasteries and schools and up into the military, where the tradition grew into a nightly event. In the United States, Mess Nights have become special events designed to commemorate anniversaries and honor group and individual accomplishments. These events have strict guidelines, described in military manuals, from how the room should be decorated to how to pass the port around the table. The Wisconsin Veterans Museum is excited to take this formal military tradition and make it our own. Each quarter MESS NIGHT AT THE MUSEUM will feature a different speaker, topic, and dining menu for guest to experience during this new event. Your fee includes dinner, drinks (alcoholic beverages available at a cash bar), and time to socialize before and after the dinner and talk. Menus for each event will be posted on our events page as they become available, and dietary restrictions or preferences should be disclosed on the registration form.